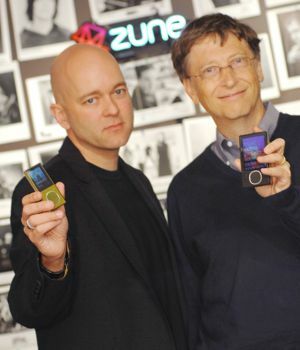 Microsoft Chairman Bill Gates and Corporate Vice President J Allard, above, yesterday unveiled the next generation of Zune portable media players, software and online store. Gates and Allard also introduced Zune Social, a beta online community Web site. The new Zunes feature a squarish button, better wireless features and even limited podcast support. To top things off, Microsoft introduced several Zune accessories, including a new Zune sync cable. The new models of Zune portable media players feature the new Zune Pad, aka the squircle, a touch-sensitive button for navigating on the device, as well as wireless sync, a feature that allows Zune devices to automatically sync over the device owner‚Äôs home wireless network when it is connected to an AC adaptor, in a dock or speaker dock accessory. Existing Zune owners will automatically receive new software features, the redesigned PC and device software and access to the new Zune Marketplace when everything is released to the public in mid-November. 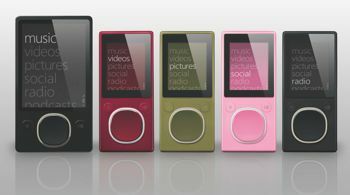 Zune 8GB (ERP $199.99) flash models, both available in pink, green, black and glossy red. Every Zune device includes built-in wireless features and an FM tuner, and they all have a bright color display that is perfect for showing off album art, pictures, videos and podcasts. All devices have been given distinctive new menus, and it is easy to customize the background screen with a personal picture. The most interesting aspect of Microsoft’s announcements may be that Zune 30GB devices will be automatically updated with all the new features as well as the new device software design this fall. Apple has been known for only rolling out new features to new iPods. Wireless sync. Zune devices will automatically sync over consumers‚Äô home wireless networks with this helpful new feature, aimed at ensuring that Zune owners always have the latest podcasts and other content ready to go when they‚Äòre leaving home. Syncing with the collection on their PC happens via a home wireless network and will start on its own when the device is placed in its dock or plugged in to charge. Alternatively, the sync can be started manually. Extended wireless sharing.Share select full-length songs, albums, playlists, pictures and even audio podcasts from device to device. Consumers can now listen to any song received up to three times with no time restrictions, and they can now also pass along songs to other friends who have a Zune. Recorded television content to go. The Zune software will now automatically import broadcast content recorded on Microsoft Windows Media Center for Windows Vista Home Premium or Ultimate, so consumers can sync them onto their Zune media player and watch them on the bus, in their car or wherever they want when they‚Äôre out and about. Launching first in beta, Zune Social, is a social networking site focused on music. The site lets you create a free, customizable Zune Card that automatically updates to reflect the music you listen to on your Zune or with Zune software on their computer. Zune Social will eventually let you place the Zune Card on popular social networking sites, where it will continue to update automatically and show off what its owners are listening to. In addition to creating a friends list, members of Zune Social can send song links and messages to each other, post comments on a friend‚Äôs profile page or on their favorite artist pages. They can discover new music by seeing what their friends are listening to, receiving recommendations from others in the community or by seeing what the top fans of artists they‚Äôre interested in are listening to. Each artist page will list the Zune Cards of the people who listen to that artist the most, making it easy for other Zune Social members to browse their recent playlists and discover new content they can sample, purchase or download with a Zune Pass. The Zune Marketplace online store received an update, too. In addition to offering more than 3 million songs, about half the number available within iTunes. The updated version of Zune Marketplace will launch with thousands of music videos for sale and over 1,000 of the top audio and video podcasts available for free. The iTunes store currently offers over 125,000 podcasts. Consumers will also be able to choose from a selection of more than 1 million digital rights management (DRM)-free MP3s, which can be played with Zune or any other digital media player. To let music fans try new music, Zune Marketplace continues to offer Zune Pass, which lets consumers download as much music as they want for a flat monthly rate of $14.99. Consumers can also choose to purchase music and music videos individually using Microsoft Points. Zune will also be offering a new line of accessories. Original Zune accessories will work on new Zune devices and new accessories will also work with the Zune 30GB device. Apple is notorious for breaking compatibility with iPod releases.